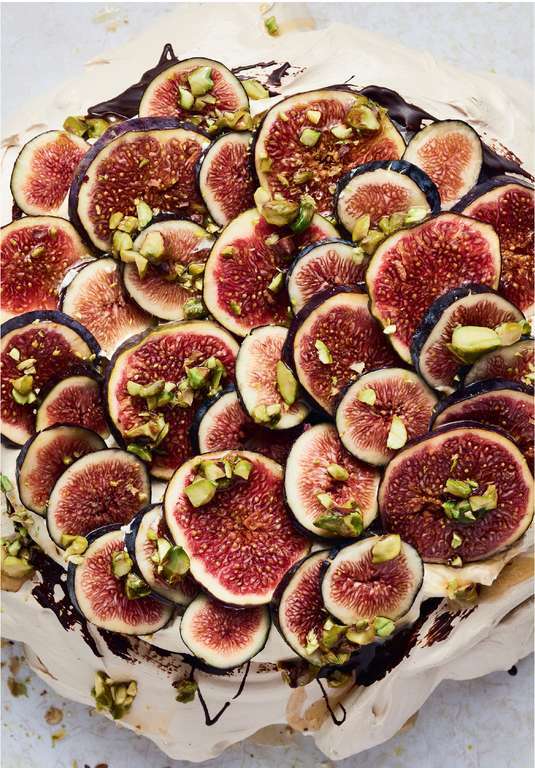 Ottolenghi's recipe for Pavolova, Praline Cream and Fresh Figs is a true showstopper of a dinner party dessert sure to solicit gasps from awed guests. 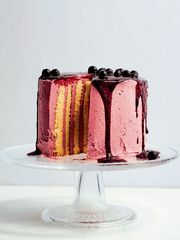 This is a stunning dessert for a special occasion. 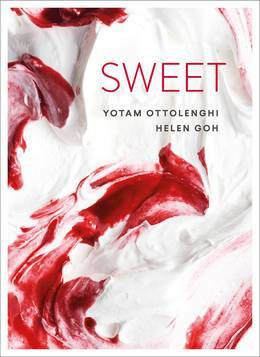 It also has a nice element of surprise, as the meringue base is not quite what you might expect: gooey – almost toffee-like – rather than dry and crispy. This is due to the brown sugar in the mix. 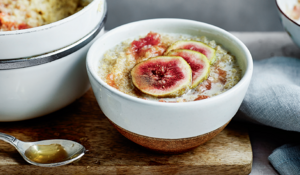 Combined with the praline cream and fresh figs, it’s absolutely delicious. 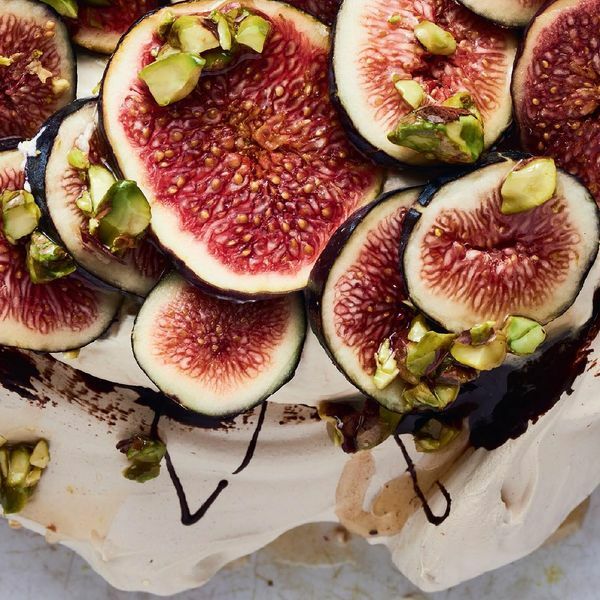 Pavlova is the dessert to make when you have a bit of time and are feeding people you adore. The recipe calls for flaked almonds but you can easily substitute those with chopped pistachios, as photographed. You will need: an electric mixer and a food processor. 1. Preheat the oven to 170°C/150°C Fan/Gas Mark 3. 2. Spread out all the almonds (for both the pavlova and the praline, 70g) on a baking tray and toast for 7–8 minutes, until golden brown. Remove from the oven, divide into two piles (20g for the pavlova, 50g for the praline) and set aside to cool. 3. Reduce the oven temperature to 120°C/100°C Fan/Gas Mark ½. Cover a large baking tray with baking parchment and trace a circle, about 23cm in diameter, on to the paper. Turn the paper over so the drawn-on side is facing down but still visible. 4. First make the meringue. Pour enough water into a medium saucepan so that it rises a quarter of the way up the sides: you want the bowl from your electric mixer to be able to sit over the saucepan without touching the water. Bring the water to a boil. 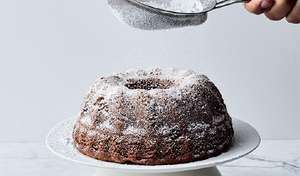 Place the egg whites and sugars in the bowl of an electric mixer and whisk by hand to combine. Reduce the heat under the saucepan so that the water is just simmering, then set the mixer bowl over the pan, making sure the water doesn’t touch the base of the bowl. Whisk the egg whites continuously by hand until they are warm, frothy and the sugar is melted, about 4 minutes, then transfer back to the electric mixer with the whisk attachment in place and whisk on a high speed for about 5 minutes, until the meringue is cool, stiff and glossy. Add the cinnamon and whisk to combine. 5. Spread the meringue inside the drawn circle, creating a nest by making the sides a little higher than the centre. Place in the oven and bake for 3 hours, then switch off the oven but leave the meringues inside until they are completely cool: this will take about 2 hours. Once cool, remove from the oven and set aside. 6. 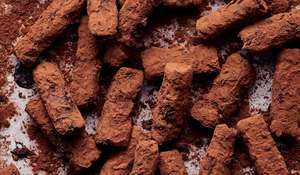 Place the chocolate into a small heatproof bowl and set it over a small saucepan of simmering water, making sure the base of the bowl is not touching the water. Stir occasionally until melted. Cool slightly, then brush the chocolate inside the meringue nest, leaving the top and sides bare. Do this gently, as the meringue is fairly delicate. Leave to set for about 2 hours. 7. Make the praline. 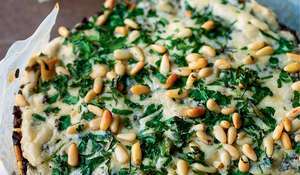 Place the 50g toasted almonds on a parchment-lined baking tray (with a lipped edge) and set aside. 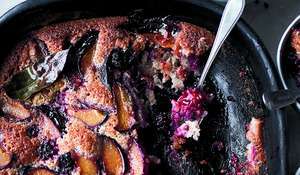 Put the sugar and water into a small saucepan and place over a medium-low heat, stirring until the sugar has melted. Cook, swirling the pan occasionally, until it turns a dark golden brown. Pour the caramel over the nuts (don’t worry if they’re not all covered) and leave until completely cool and set. Once cool, transfer the praline to the small bowl of a food processor and blitz until fine. 8. 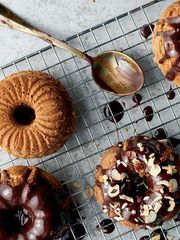 Place the cream, mascarpone and blitzed praline in a large bowl and whisk for about 1 minute, until stiff peaks form. Be careful not to over-whisk here – it doesn’t take much to thicken up – or it will split. If this begins to happen, use a spatula to fold a little more cream into the mix to bring it back together. Refrigerate until needed. 9. 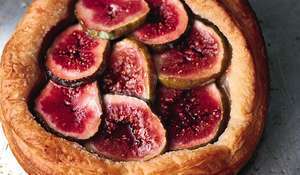 To assemble, spoon the cream into the centre of the meringue and top with the figs. Warm the honey in a small saucepan and stir through the 20g almonds (or pistachios, as pictured). Drizzle these over the figs, and serve. The praline (after blitzing but before it’s mixed with the cream) can be made up to 3 days in advance and stored in an airtight container. 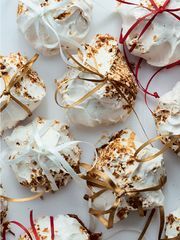 The meringues need to be made in advance – they take 3 hours to cook, 2 hours to cool in the oven, and another 2 hours to set, so you’re forced to get ahead by at least this much – but they will also keep for up to 3 days loosely wrapped in foil. Once assembled, the pavlova should be eaten as soon as possible. It will hold for a couple of hours, but it won’t look as good after that.